News Updater is a small software that can provide a clear and easy Grafical User Interface for anyone who wants to update his/her site. First a template needs to be created to reflect the look and feel of the site. Then some FTP data, filenames and locations (where the files should be put) are required. After this anyone will be able to upload an article to your site with ease. No scripting knowledge is required, it's quick and easy. News Updater is a stand-alone program which does not need any CGI-bin or database installed on the hosting server. This means that it can be used for any static site. Your only requirement is FTP support. The News Updater solution for CMS also speeds up a site's performance. A static page can be delivered much faster than any script-generated page since no database needs to be inquired for content. - Text decoration like Bold Italics Underlined and Striked. 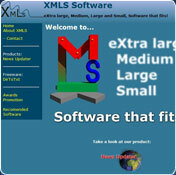 - Images are automatically resized to maximum constraints preserving the aspect ratio. - Automatic HTML Charter code conversion. - Automatic link and E-mail detection (makes the url work as a hyperlink). News Updater is free for personal non-commercial use. However for some features like password protection and a customized about-box (with your logo), registration is required. You cannot download any crack or serial number for News Updater on this page. Every software that you are able to download on our site is legal. There is no crack, serial number, hack or activation key for News Updater present here. Our collection also doesn't contain any keygens, because keygen programs are being used in illegal ways which we do not support. All software that you can find here is freely downloadable and legal. News Updater installation package is prepared to be downloaded from our fast download servers. It is checked for possible viruses and is proven to be 100% clean and safe. Various leading antiviruses have been used to test News Updater, if it contains any viruses. No infections have been found and downloading News Updater is completelly problem free because of that reason. Our experts on malware detection tested News Updater with various spyware and malware detection programs, including fyxm.net custom malware and spyware detection, and absolutelly no malware or spyware was found in News Updater. All software that you can find on our servers, including News Updater, is either freeware, shareware or open-source, some of the software packages are demo, trial or patch versions and if possible (public domain licence), we also host official full versions of software. Because we want to be one of the fastest download sites on the web, we host all the software including News Updater on our servers. You cannot find here any torrents or download links that would lead you to dangerous sites.